Take advantage of the lower prices for red bell peppers this month. There are so many different ways to fill them and they make a delicious entrée for dinner. Preheat the oven to 400°F Coat a small baking dish or ramekin with olive oil cooking spray. Slice the bell pepper in half lengthwise and remove the ribs and seeds. Place pepper halves in the prepared baking dish and bake for 20 minutes on the middle rack of the oven. Remove the peppers from oven. Mix the ricotta cheese with the salt and Parmesan cheese. Fill each pepper half with ¼ cup of the tomato sausage sauce. Spoon 2 tablespoons of the ricotta cheese mixture on top of the meat sauce in each pepper cup. Pour an additional 2 tablespoons of sausage sauce on top of the ricotta cheese in each pepper half. Top each pepper with 2 tablespoons mozzarella cheese. Bake on the middle rack for 15-20 minutes. You will only need a small portion of this sauce for the stuffed pepper recipe, depending on how many peppers you make. Leftover sauce can be used in a number of other dishes. Place the oil in a large non-stick sauce pan over medium-high heat. When the oil is hot, add the sausage, onion, garlic and sea salt. Cook until the sausage is brown. Drain off any grease in the pan. Add the tomatoes, tomato paste, Italian seasoning and red pepper flakes. Reduce heat to low and simmer uncovered for 30 minutes. Combine all of the meatball ingredients in a medium bowl and mix thoroughly. Using a small cookie scoop, form into 24 bite-sized meatballs and place on a baking sheet covered with foil and coated with vegetable cooking spray. Bake at 375 degrees F for 15-20 minutes or until cooked through. In a large saucepan heat the sesame oil, garlic and ginger for about 1 minute or until sizzling. Add the chicken broth, water, soy sauce, fish sauce, red pepper flakes and salt. Bring to a boil and simmer for 10 minutes. Have you ever thought of pumpkin as a savory side dish. I hadn’t either until I saw an article that suggested pumpkin was a fall squash that deserved more than being a pie. And they were right. It is delicious. Do not use a large decorative pumpkin. Instead use a sugar/cooking pumpkin between 2 and 3 lbs and your favorite spices. Place the oil on a baking sheet with sides. Add the pumpkin slices and sprinkle the seasonings over the pumpkin. Bake in the oven for about 45 minutes until the pumpkin is soft and tinged brown at the edges. Turning the slices over halfway through the cooking time. Cut off the tough ends and stalks of the broccoli stems. Wash the trimmed broccoli rabe in a sink filled with cold water, swishing the stems gently to remove all dirt from between the leaves. Let the leaves sit a minute or two undisturbed to allow the dirt to settle to the bottom of the sink, then lift the broccoli rabe from the water with your hands and drain in a colander. Place the broccoli in a deep skillet and cover with water. Bring to a boil, cover the pan and cook the broccoli until tender, about 5 minutes. Drain and place on a kitchen towel to dry. Wipe out the skillet and heat 2 tablespoons of the oil over medium heat. Add the sausage and cook, turning as necessary, until caramelized on all sides and no trace of pink remains in the center, about 8 minutes for thin sausage or longer for thicker sausages. Remove the sausages to a plate and cover with aluminum foil to keep them warm. Pour in the remaining 2 tablespoons olive oil and add the garlic to the oil. Cook, shaking the pan, until golden brown, about 1 minute. Carefully lay the broccoli rabe into the oil, season lightly with salt and 1/4 teaspoon crushed red pepper. Stir and toss to distribute the seasonings. Pour 1/4 cup water into the skillet and bring to a boil. Cover the skillet tightly and cook, lifting the lid to turn the stalks occasionally, until the broccoli rabe is tender and the water evaporates, about 5 minutes. Return the sausages to the skillet and heat until warmed through. Serve the sausages and broccoli rabe on a serving platter with crusty Italian bread. With family visiting for the holidays, I had plenty of leftovers to use up. Leftover vegetable dishes can become salads, such as my Green Bean Salad recipe. Leftover pork and steak can become new entrees. Leftover Tzatziki Sauce needed a new entre dish to accompany, so a middle eastern chicken dish is perfect. Leftover asparagus is always good in an omelet or a quiche. So many new meals from leftovers. Give your leftovers a makeover. Serve this pasta with a Green Bean Salad. Cook pasta al dente according to the package directions. Drain. Heat oil in a Dutch oven over medium-high heat. Add red pepper and garlic to pan; sauté 1 minute. Add shrimp; sauté 1 minute. Stir in tomatoes, tomato paste, basil and salt. Turn the shrimp over once and cook until pink on all sides. Stir in pasta and Parmesan cheese; cook 1 minute or until thoroughly heated. Place pasta mixture in individual heated pasta bowls; top each serving with 1 tablespoon ricotta cheese. 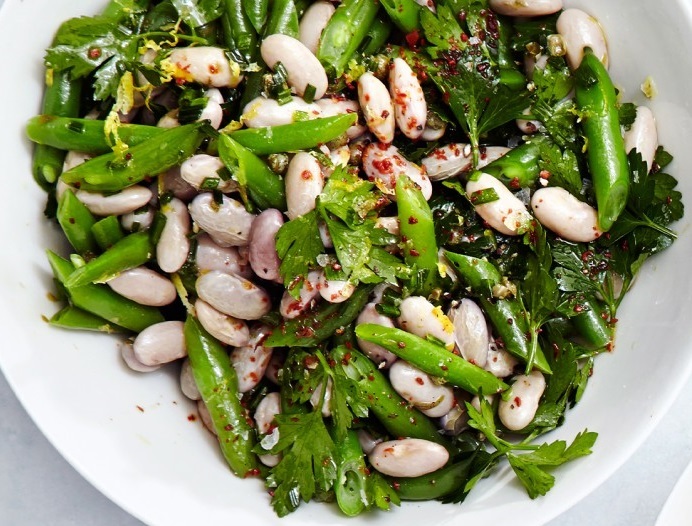 You can also use leftover cooked green beans for this salad. Cook green beans in a large pot of boiling salted water until crisp-tender, about 3 minutes. Drain and let cool. Place the radishes and the cooled beans in a serving bowl . Combine the olive oil, shallots, vinegar and lemon juice in a large measuring cup. Pour over the radishes and green beans and toss to coat. Let marinate 1 hour at room temperature, tossing occasionally. Preheat an outdoor grill to medium. Stir cucumber, yogurt, lemon juice and 1/4 teaspoon salt together in a medium bowl. Set aside. Combine garlic, za’atar, 1/2 teaspoon black pepper and 1/4 teaspoon salt in another medium bowl. Slice chicken breast crosswise into 1/4-inch strips; toss with the spice mixture to coat. Add 1 tablespoon oil and toss to combine. Grill the chicken on a stove top grill, turning once, until cooked through, about 2 minutes per side. Spread 1/4 cup of the cucumber-yogurt sauce on a pita (or lavash) and top with one-half of the chicken, tomato and lettuce. Fold like a taco (or roll closed, if using lavash). Repeat with the remaining ingredients. Slice bread in half lengthwise and then in half horizontally. Butter the outside of the bread. Spread mustard on the insides of the bread and layer each sandwich with 1/2 of remaining ingredients. Set tops of rolls in place and press down to flatten sandwiches. Heat large nonstick skillet over medium-low heat for 4 minutes. Meanwhile, heat large pot or Dutch oven over medium-low heat for 4 minutes. Brush the tops of the sandwiches with melted butter and place them in the skillet buttered side down. Brush the bottoms of the rolls with butter and use the preheated pot to compress the sandwiches for 15 to 20 seconds. Cook (keeping the pot on the sandwiches but no longer pressing down) until the first side is golden brown, 3 to 4 minutes. Remove the pot, turn the sandwiches over, replace the pot on top of the sandwiches, and cook until golden brown, 3 to 4 minutes more. Serve immediately. Heat the oil in a nonstick skillet over medium-high heat. Add the leeks and cook, stirring occasionally, until starting to soften,4- 5 minutes. Add the shallots and saute for another 3 minutes. Add the Italian seasoning, asparagus, a large pinch of salt and a pinch of black pepper. Stir and remove the pan from the heat and let cool. When the mixture is cool, add the beaten eggs. Pat the crescent roll dough into a 9-by-13-inch baking dish. Arrange the sliced, drained tomatoes over the dough. Spread the asparagus mixture over the tomatoes. Sprinkle the cheese over the top. Bake until golden brown, 30 to 40 minutes. Cut into squares and serve. Brush a large frying pan with olive oil and heat the pan. Lay a tortilla on the bottom of the pan. Cover evenly with one half of the steak, onion, jalapenos and cheese. Top with another tortilla shell. Cook for about 4-5 minutes or until the bottom tortilla begins to lightly brown and then use a wide spatula to turn the quesadilla over and cook for another 4-5 minutes. Repeat with the remaining quesadillas. Cut the quesadillas into quarters and serve with salsa and sour cream. The arrival of spring brings out the lighter side in our dining habits, with dishes emphasizing fresh flavors, such as fruit, herbs, tender greens, seafood and more. 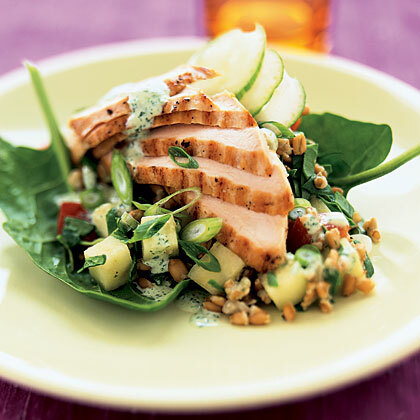 Mild spring salads with their seasonal ingredients complement the warming weather. 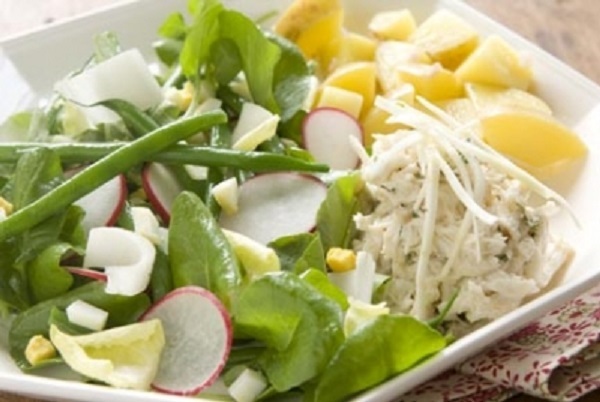 A spring salad can be as simple as tender greens tossed with a vinaigrette or you can dress it up by adding seasonal ingredients, like peas, asparagus, radishes and baby artichokes. Tender greens are best in spring. Leaves should be bright and fresh looking. 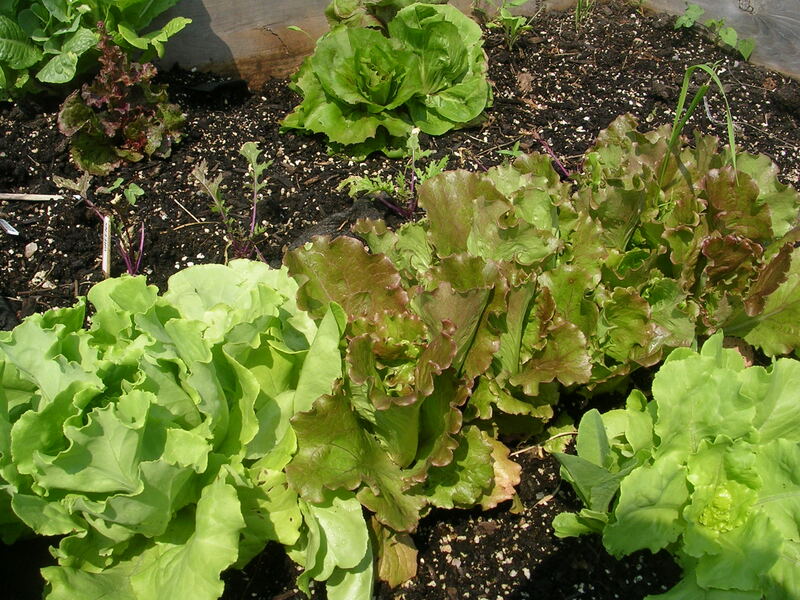 Choose crisp lettuces that are free of blemishes. Lettuce should be washed and thoroughly dried in a salad spinner to remove any excess moisture. Refrigerate washed-and-dried greens wrapped in dry paper towels in an airtight plastic bag for about five days. Here are some recipes for spring salads that can be used as a first course, for lunch or as a main dish. 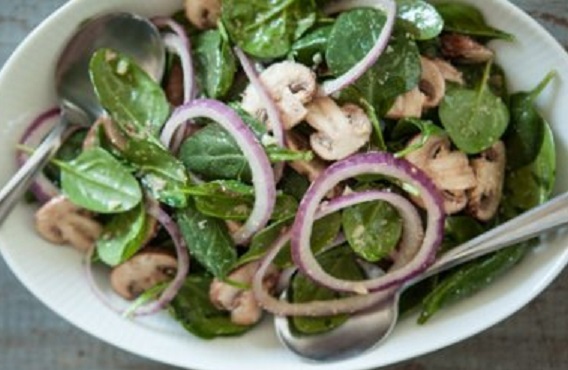 Place spinach, mushrooms and onion in a large salad bowl. Heat oil in a small skillet over medium-low heat. Add garlic and cook, stirring frequently, until very fragrant, about 1 minute. Add anchovies and cook, stirring, 30 seconds. Remove from the heat and stir in vinegar and then cheese. Pour the warm dressing over the salad, toss well and serve with a pepper mill on the table, so that you can top your salad with plenty of freshly ground black pepper. Cook the green beans in boiling salted water for about 4 minutes, just until tender but still firm. Drain. Mix the beans, green beans, parsley, oil, chives, capers, lemon zest, lemon juice and Aleppo pepper in a large bowl; season with salt and pepper. Let the salad sit for at least 30 minutes to infuse the flavors. Preheat the oven to 400°F. Mix the bread with lemon zest and ¼ cup oil on a rimmed baking sheet. Bake, tossing occasionally, until crisp on the outside but still chewy in the center, 8–10 minutes. Let cool. Whisk shallot, lemon juice, vinegar and oregano in a large salad bowl; season with salt and pepper. Whisk in remaining ¼ cup oil. 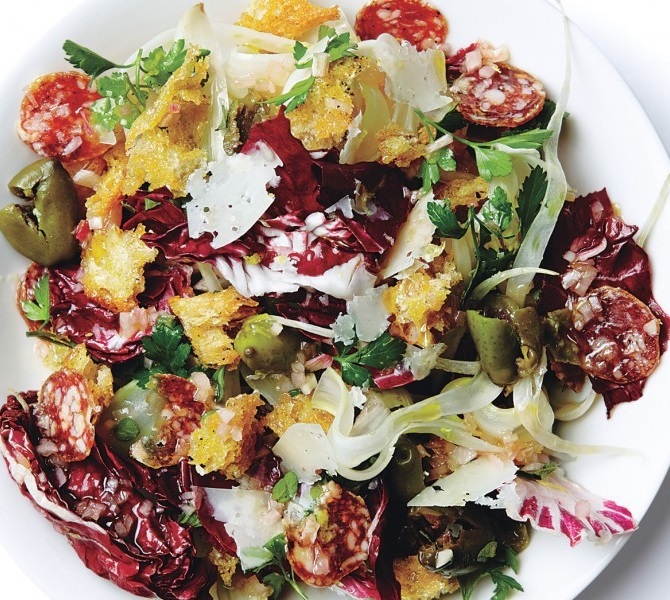 Add radicchio, fennel, parsley, olives, cheese, salami and toasted bread to the dressing; toss to combine. Place the 1/4 cup basil leaves, parsley, 2 tablespoons pine nuts, 1 teaspoon lemon juice and the shallots in mini processor; chop coarsely. With machine running, gradually add 3 tablespoons olive oil. Season pesto to taste with salt and pepper. Add more olive oil by teaspoonfuls to thin, if you want a thinner pesto. Whisk the 2 teaspoons chopped basil, remaining 4 teaspoons lemon juice and 3 tablespoons oil in small bowl. Season dressing with and pepper. Set aside. Prepare barbecue (medium-high heat). Brush chicken breasts on both sides with oil. Sprinkle with salt and pepper. Grill until grill marks form and chicken is cooked through, 7 to 8 minutes per side. Transfer to a work surface; let rest 5 minutes. Using a clean brush, brush both sides of the bread slices with oil. Grill until dark-brown grill marks appear on both sides, 2 to 3 minutes per side. Place greens, radishes and cucumbers in large bowl. Toss with the reserved dressing. Season to taste with salt and pepper. Divide salad among 4 plates. Cut grilled chicken breasts crosswise into thin slices. 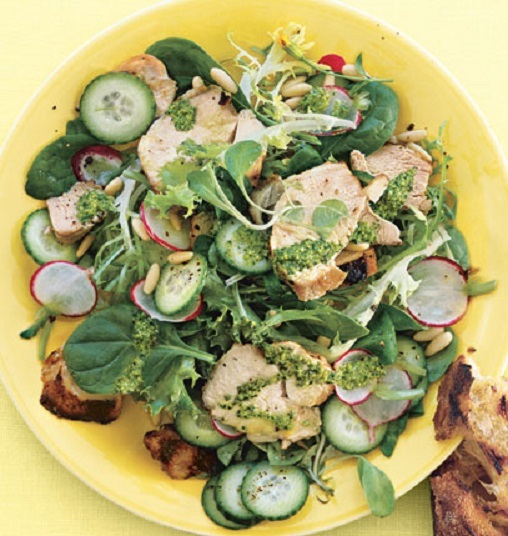 Arrange 1 sliced chicken breast on top of each salad. Spoon pesto over the chicken. Sprinkle remaining 2 tablespoons pine nuts over salads. Serve with grilled bread slices. Combine mayonnaise and the next 7 ingredients in a bowl; slowly whisk in olive oil. Stir in rosemary. Store in the refrigerator until serving time. Combine the wine, mustard, 1 tablespoon olive oil, chopped rosemary and garlic in a large, heavy-duty zip-top plastic bag. Add the steak and the seal bag, turning to coat. Preheat grill to high (450°F to 600°F). Remove steak from the marinade and discard marinade. Pat steak dry with paper towels and sprinkle with salt and pepper. Grill, on a greased grill rack, 6 minutes on each side (for medium-rare) or to the desired degree of doneness. Let stand 5 minutes before cutting into thin slices. Brush bread slices with oil and grill 2 to 3 minutes. Toss spinach with 1/4 cup of the dressing and divide among 4 salad plates. 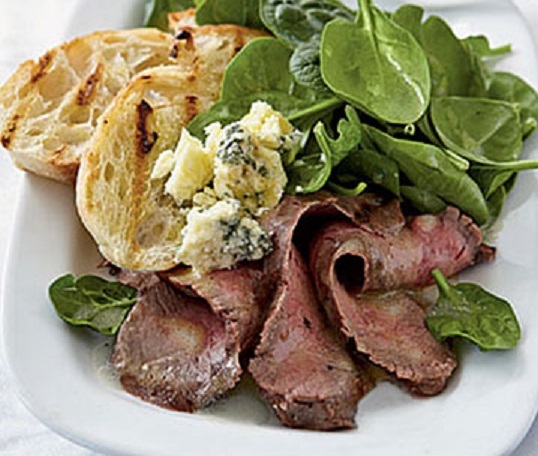 Place steak slices on top of the greens and sprinkle each with crumbled Gorgonzola cheese. Serve the salads with grilled baguette slices and pass the remaining dressing. A salad is only as good as the quality of its ingredients. To make a truly great salad, you’ve got to use ingredients that are fresh, ripe and in season. If you think salads are limited to watery lettuce and a few chopped tomatoes and cucumbers, think again. There are endless amounts of wonderful combinations and you can make a salad as simple or as complex as you like. Spend a minute thinking about the contrasts of tastes and textures in the ingredients you are choosing and what sort of dressing you want to use, so you end up with something delicious and exciting every time. The ingredient that forms the bulk of your salad is the base. And when we hear the word ‘salad’, lettuce is often the first ingredient that comes to mind because it is used as a base for so many salads. Oakleaf, cos or romaine lettuce and baby mixed lettuces, also make great salad bases, as do chicory, radicchio, arugula, watercress, baby spinach, tiny red-veined chard leaves, mustard leaves, pea shoots and sorrel. But plenty of salads don’t have any lettuce in them at all. You can make beautiful salads using cooked new potatoes, couscous, lentils, shredded cabbages or any other robust interesting vegetable. Use your imagination and you’ll never be bored. Wash your salad leaves before using them. Make sure your sink is clean then fill it with cold water. Gently wash the salad leaves in the water until they are clean and then transfer them to a salad spinner and spin dry. If you don’t have a salad spinner, put them into a clean tea towel, gather the edges up and spin it around your head. Make sure the leaves are dry – if they aren’t, the salad dressing won’t cling to them. Keep them in the refrigerator or bowl under a damp cloth until you’re ready to use them. WHAT ELSE CAN YOU ADD TO A SALAD? Raw crunchy veggies, like carrots or radishes, are great in salads. But they can be quite hard if they’re in big pieces, so finely slice them or shave them into ribbons with a peeler. Beets, spring onions, cucumber, squash and celery all work well. Cooked vegetables are also fantastic in salads. Peas, beans, asparagus and corn, cooked very quickly so they are not mushy, add flavor and color. Grilled slices of zucchini or pepper or even chunks of roasted squash or pumpkin also make salads much more interesting. Adding soft herbs at the last-minute adds loads of extra flavor. Basil, tarragon, parsley, dill, mint or even thyme or marjoram tips are all great choices. It’s also nice to add a bit of protein to a salad, especially if you’re having it as a main meal. Use your imagination; there are really no limits to what you can include. Try a few slices of smoked salmon, shredded roast chicken, cooked shrimp, hard-boiled eggs, buffalo mozzarella, crispy bacon, cannellini beans, lentils or crumbled goat cheese. For a bit of crunch, try adding a few nuts or seeds. Toasted or flaked almonds, pumpkin seeds, pine nuts, crumbled walnuts and chopped cashews all work well. Think of your salad dressing as the link that brings all the ingredients in your salad together. There are loads of ready-made bottled dressings available in the markets, but it’s so easy to make your own, so try to get into the habit of doing that rather than buying them. Store-bought dressings are likely to contain lots of hidden ingredients and may be high in calories and sugar. Plus if you make your own, you can tweak it every time to suit the other ingredients in your salad. The easiest way to make your salad dressing is in a clean jar. Just add all of your ingredients, pop the lid on and give it a good shake! 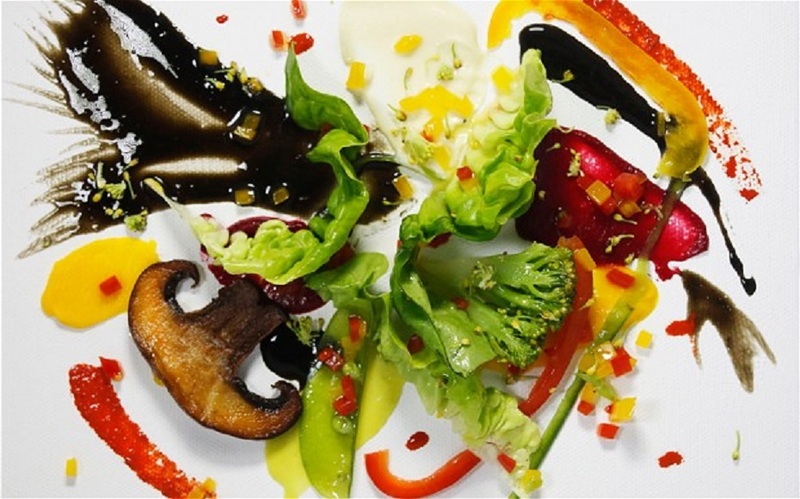 Most salad dressings contain an oil element – such as extra virgin olive oil, nut oil or sesame oil – and an acid element, such as balsamic vinegar, red wine vinegar, or lemon or lime juice. Aim for a ratio of 3 parts oil to 1 part acid, then add any other ingredients you fancy. Half a teaspoon of Dijon mustard or some finely chopped fresh herbs or chillies can add loads of flavor. If you want a slightly creamy dressing, try stirring a spoonful of natural yogurt into the dressing. Once dressed, salad leaves can wilt after a few minutes, so always add your dressing right before serving. If you want to ensure a really good even coating, using clean hands, quickly toss everything together. Just make sure you don’t add all of the dressing at once; add a little, mix it up, then have a taste before deciding whether you need to add more. You can always add more, but you can’t take it away. In a large bowl, whisk together lemon juice, garlic, oregano, salt, coriander and pepper. Whisk in oil in a slow, steady stream until blended. Add romaine, mint, parsley, tomatoes, radishes, green onions, cucumber and toasted pita and toss until blended. Serve immediately. Whisk yogurt, garlic, lemon zest, olive oil, vinegar, thyme, salt and pepper in a small mixing bowl until smooth. Thin with up to 3 tablespoons of water so it dribbles off a spoon. Let stand at room temperature at least 15 minutes to develop flavors. (Can be made up to 2 days in advance and stored in the refrigerator.) Makes 1 cup. Preheat a gas or charcoal grill for high heat, pat steak dry and season with salt and pepper. Grill 4 to 5 minutes per side for medium-rare. Transfer to a plate and let rest 10 minutes before slicing into thin strips. Make a bed of romaine on a large serving platter and sprinkle with parsley. 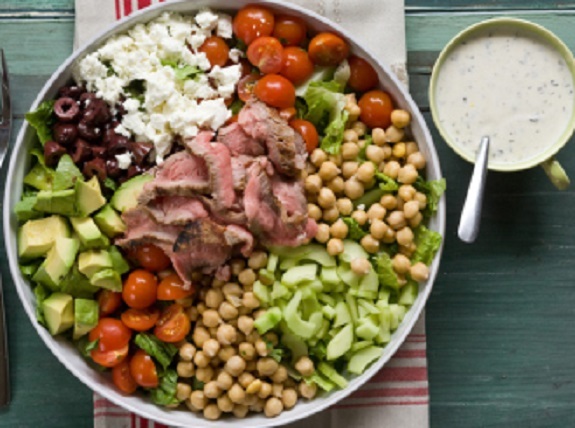 Arrange cucumber, tomato, chickpeas, avocado, olives and feta in mounds and place steak strips in the center. Pass the dressing on the side. Stir together shallot, hot sauce, mayonnaise, mustard, lemon juice and chives in a medium bowl. Add crabmeat and lightly toss. Season with salt and pepper. Cover and chill. Whisk together mustard, shallot, vinegar, chives and lemon juice. Slowly whisk in olive oil until dressing slightly thickens. Taste and adjust seasoning with salt and pepper. Set aside. Steam Yukon gold potatoes until tender when pierced with a fork. While potatoes are still warm, pour a tablespoon or two of dressing over them. Steam green beans until tender. Transfer to a bowl of ice water to stop the cooking. Drain thoroughly. Combine green beans with arugula, endive and radish. Toss with a tablespoon of dressing. Toss fennel with remaining dressing in a small bowl. Check over the crab for any pieces of shell. Arrange greens on a platter or individual plates. Top with crab, fennel and eggs. Garnish with chives and serve immediately. 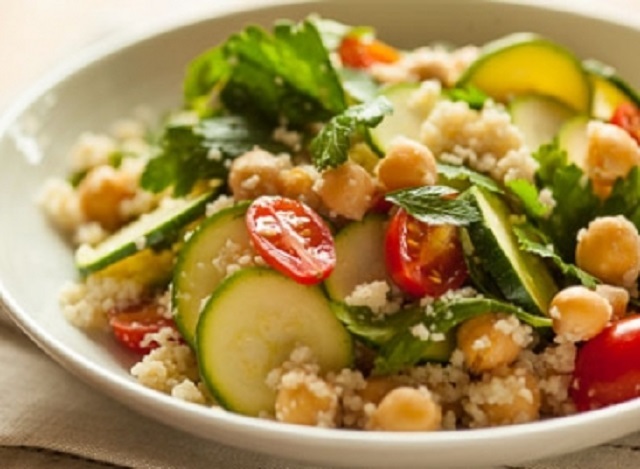 In a large, heatproof bowl, pour water over couscous, cover and set aside for 5 minutes. Uncover, fluff with a fork and set aside to let cool for 5 minutes more. Meanwhile, whisk together vinegar, tahini and salt in a second large bowl. Thinly slice zucchini over dressing and then use kitchen shears to snip parsley leaves into the bowl; discard stems. Add tomatoes, beans and couscous and toss gently to combine. Combine the first 3 ingredients in a saucepan over medium-high heat. Bring mixture to a simmer; cover and cook for 2 hours, 15 minutes or until wheat berries are almost tender. Drain and place in a salad bowl; discard bay leaf. Coarsely chop the spinach leaves. Add spinach, apple, bell pepper and 3 tablespoons of the cucumber dressing to the wheat berries and toss well. Sprinkle chicken with salt and pepper. Place chicken on a grill rack coated with cooking spray; grill 5 minutes on each side or until done. Thinly slice chicken. 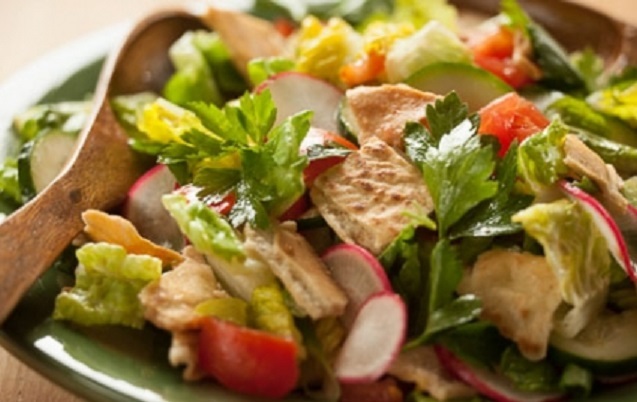 Arrange chicken evenly over salad mixture; sprinkle with green onions. Pass dressing on the side. 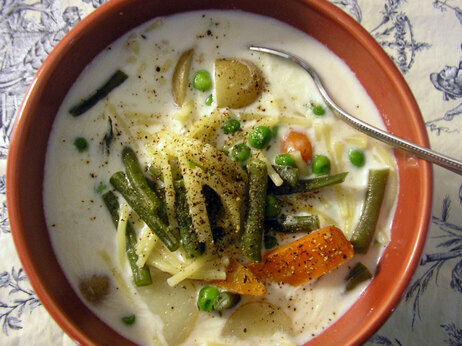 This time of year is perfect for lighter soups that showcase the flavors of seasonal vegetables. Taste isn’t the only reason for cooking up a big pot of spring soup. It can save you money, too. In a study published in the American Journal of Clinical Nutrition, Cornell University scientists found that the cost per serving is usually lower for in season fresh food than for processed food. Further, a recent USDA Economic Research Service analysis found that fresh seasonal produce costs 12 to 18 cents per serving on average. Eating in-season fruits and vegetables will also provide you countless health benefits, thanks to an almost endless variety of nutrients. Italians enjoy food in its most straightforward state—no fuss, just real ingredients in their purest form, allowing for the integrity the of the ingredients to shine. They also use the time of year as their guide and work with products available, visiting their local grocers or farmer’s markets to see what is fresh. The delicate flavors in these soups are a direct reflection of the new beginnings taking place around us in our environment. Sometimes the most effortless dish makes for the most appetizing meal. These soups provide the perfect way to incorporate spring’s most green ingredients: peas, asparagus and artichokes, to name a few. All great soups start with the basics- carrots, onions and celery- with variations like shallots, leeks, garlic and even fennel. The goal of a great soup is to build upon the basics to create a wonderful and balanced set of flavors, which can take hours or just 30 minutes. When making Italian soups, it’s best to start with traditional ingredients and then add your own personal flair to achieve something new and unique. Soups are a great way to showcase your individuality and taste. The first two soup recipes below are two of my favorites for this time of year and I make them on a regular basis. The last group of soups are ones that I adapted from the cookbook,The Glorious Soups and Stews of Italy by Domenica Marchetti, Chronicle Books, 2006. They are great examples of the kinds of soups made in Italy and in Italian American homes, that utilize all the wonderful springtime produce that are found in markets this time of year. I have changed some of the ingredients and some of the techniques to suit my family’s palate. Separate broccoli stems from florets. Using a vegetable peeler, peel stems to remove tough outer layer, then slice into 1/4-inch-thick “coins.” Break or cut the florets into small pieces. Reserve stems and florets separately. In a medium saucepan, heat oil and butter over medium heat. Add leeks and cook, stirring often, until softened, about 3 minutes. Add broccoli stems, potato and garlic and cook 2 to 3 minutes. Add 3 cups broth, salt and pepper; bring to a boil. Reduce heat; cover partially and simmer until broccoli and potato are tender, about 12 minutes. Puree soup with an immersion blender until smooth. Return soup to the heat; add florets; bring to a boil and simmer 5 minutes. Add half-and-half and chives and reheat on low briefly. Place barley in a bowl with just enough water to cover it. Heat olive oil on medium heat in an 8-quart stockpot. Add the chopped onion and garlic to the olive oil, cooking for 5 minutes. Add the chicken to stockpot, along with the salt and black pepper. Brown for 5 minutes. Add the chicken stock, vegetables and spices to the pot. Drain the water from the barley. Add the barley to the soup. Bring to a boil and turn the heat to medium. Cook for 30 minutes or until the vegetables are just tender. Pour into serving bowls and garnish with parsley. Use a variety of lettuces for a mix of colors and textures, especially radicchio. The greens lose their bright hue when you cook them, taking on muted, earthy tones. If you want to perk up the color, gently stir in another handful or two of spinach during the last few minutes of cooking. 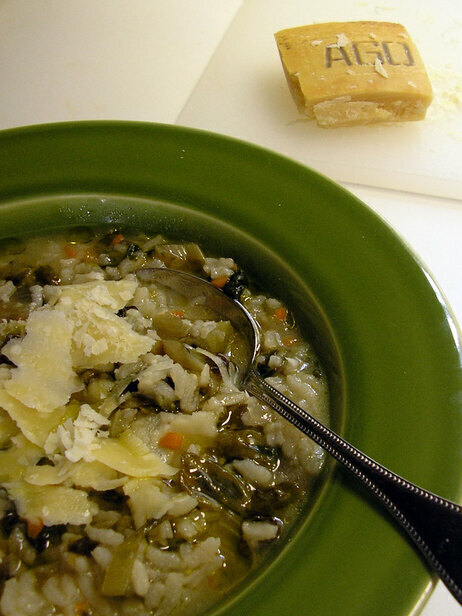 Adding a small rind of Parmigiano while the soup is simmering boosts the flavor of the broth. In a Dutch oven or other heavy-bottomed pot with a lid, heat the butter and oil over medium heat. When the butter has melted and begins to sizzle, stir in the carrot, celery, onion and parsley, and saute for about 10 minutes, or until the vegetables have begun to soften and the onion is translucent. Season with salt and then stir in the butter and romaine lettuces, radicchio and spinach, tossing the greens so that they are well-coated with the other ingredients. Cook, stirring from time to time, for 5 minutes or so, just until the greens have wilted. Pour in the broth and add the Parmigiano rind. Bring the broth to a gentle simmer. Stir in the rice, raise the heat to medium-high and bring the soup to a boil. Reduce the heat to low, cover and let the soup simmer gently for 15 to 18 minutes, or until the rice is cooked. Taste and season with additional salt if necessary and a generous grinding of black pepper. Stir in 1/2 cup of the shaved or grated Parmigiano cheese. Ladle the soup into a serving tureen or into individual bowls. Garnish with a drizzle of olive oil and the remaining cheese. This recipe is Sardinian based and uses tender vegetables and broken spaghetti in a simmered milk-based broth. In Italy, this soup is made with fresh sheep’s milk or goat’s milk. In a medium Dutch oven or heavy-bottomed pot, combine the milk and water and bring almost to a boil over medium-high heat (do not let the liquid boil over). Stir in the salt, green beans and carrots, reduce the heat to medium, and cook at a bare simmer for 3 to 5 minutes, until the vegetables start to turn tender. Add the potatoes and cook for another 3 to 5 minutes, until they are just starting to soften. Stir in the pasta and simmer gently for 15 minutes, or until the pasta is al dente. Stir in the peas and cook for 2 to 3 minutes if using frozen, or slightly longer if using fresh, or until they are tender but still bright green. While the peas are cooking, put the cheese in a small bowl and add a few spoonfuls of the milky broth. Stir the cheese and hot broth together to make a thin paste and stir this paste into the soup until fully incorporated. Add a generous grinding of pepper and stir gently but thoroughly. To serve, ladle the soup into bowls and garnish with an additional sprinkle of cheese. Tender green asparagus, spring onions and fennel combine in this for a typical spring. Adding pearled barley to the mix gives it a little more substance. 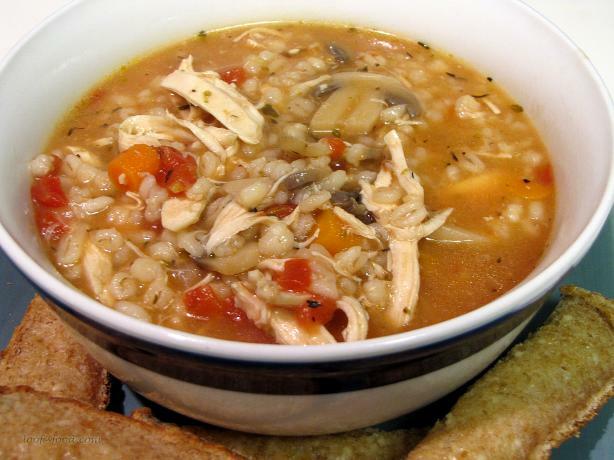 Accompany the soup with country bread for a one-dish supper. Put the barley on to cook before you start the soup: In a large saucepan, combine the water and 1 teaspoon salt and bring to a boil over high heat. Slowly pour in the barley. Reduce the heat to medium, cover partially, and simmer for 30 to 45 minutes or until the barley is tender but still a bit chewy. It should not be mushy. Reduce the heat, if necessary, so that the barley cooks at a gentle, steady simmer. Drain the barley in a colander placed in the sink and let it sit for 10 minutes. Fluff with a fork and set aside. While the barley is cooking, trim off the tough ends from the asparagus and discard them (or add them to the pot in which you are heating the broth to enhance its flavor; remove them before adding the broth to the soup). Cut the asparagus stalks into 1-inch pieces. Set aside the tips. You should have about 4 1/2 cups asparagus pieces, not including the tips. In a large Dutch oven or other heavy-bottomed pot, heat the oil and butter over medium heat. Add the spring onions and fennel, reduce the heat to medium-low and saute, stirring from time to time, for about 10 minutes, until the vegetables are softened. Sprinkle the flour over the vegetables and stir vigorously to combine. Pour in 1 cup of the heated broth and stir for a minute or so to incorporate thoroughly. Slowly pour in the remaining 5 cups of broth and add the asparagus pieces — except for the reserved tips — and the parsley sprigs. Increase the heat to medium and simmer for 15 to 20 minutes, until all the vegetables are tender. Remove from heat and let the soup cool for 10 minutes. Using an immersion or standard blender, puree the soup until smooth. Stir in the cooked barley and asparagus tips and heat gently over low heat. Season to taste with salt and pepper. To serve the soup, stir in 3/4 cup of the cheese. Ladle the soup into a large serving bowl or tureen and top the remaining 1/4 cup cheese. Mix together the radish and cucumber with the coarse salt. Place the radish and cucumber in a small colander set over a bowl and let sit for 15 to 20 minutes. Gently squeeze out the excess liquid and pat vegetables dry with paper towels. Transfer the radishes and cucumbers to a bowl and stir in the spring onion, oil, sugar and a grinding of pepper. Gently toss to combine. Cover the bowl and let sit at room temperature until serving time. In a medium Dutch oven or other heavy-bottomed pot, heat the olive oil over medium heat. Stir in the spring onions and saute, stirring frequently, for 3 to 5 minutes, or until they have softened but are not browned. Add the marjoram and thyme and cook for 1 minute, stirring. Pour in the broth, raise the heat to medium-high and bring to a simmer. Carefully tip in the peas and cook for 6 to 8 minutes for fresh peas; 3 to 4 minutes for frozen, or until they are just tender but still bright green. Take off the heat and remove and discard the sprigs of marjoram and thyme. Using an immersion blender or a standard blender, puree the soup until smooth. Return the soup to medium heat and stir in the milk, salt and pepper to taste. Heat until just warmed through. Ladle the soup into bowls and garnish with a dollop of mascarpone or ricotta cheese and top with a spoonful of radish mixture.